If you’re looking to update your makeup look, the holiday season is the perfect time to add a little glitz and glam! 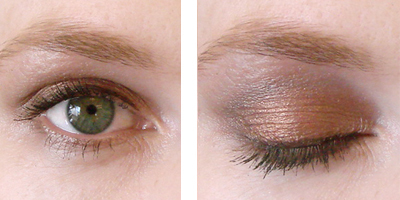 Gold and copper eye shadow is perfect for special occasions and is also wearable for everyday. Even better, gold tones are extremely flattering for a wide variety of skin tones. This Glamorous Gold Eye Shadow Quad features four shades for easy blending and customization. The classic gold shade is great base color, while the light gold is perfect for highlighting. The two darker shades are meant for shadows and contouring. I can’t wait to use these colors to create a look similar to this, or this look for a special occasion. 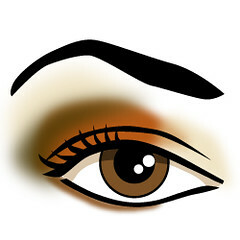 Looking for more tips on how to apply eye shadow? 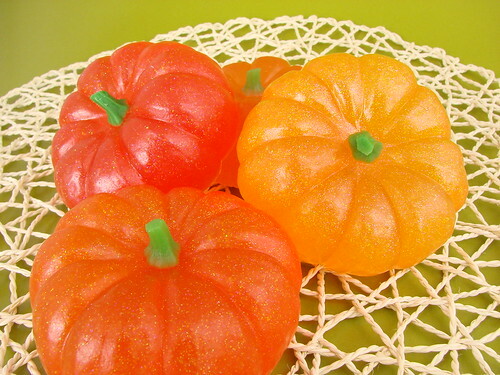 The instructions in the Pumpkin Shimmer Eye shadow Tutorial would work well for these colors as well. 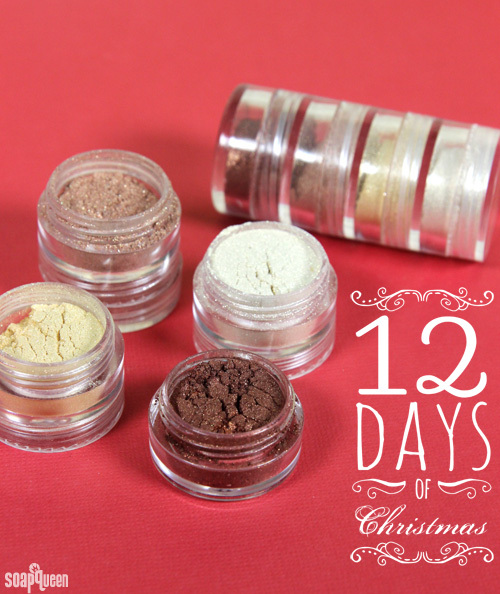 If you have never made mineral makeup before, it’s incredibly easy! 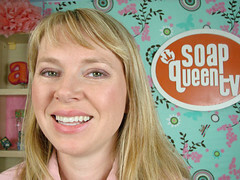 To learn more, check out this Mineral Makeup Soap Queen TV Episode. In this episode, I show how to make your own eyeshadow and eyeliner from scratch using our Mineral Makeup kit. I think you’re going to be surprised at how easy it is. 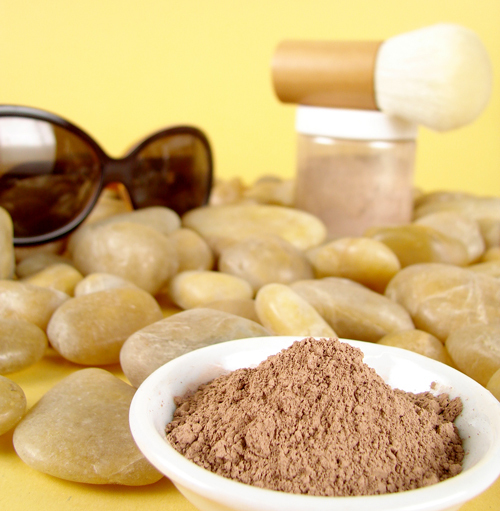 I also go over some of the most common mineral makeup ingredients and share two of my favorite recipes. Want that sun soaked radiance – without the dangerous effects of UV? 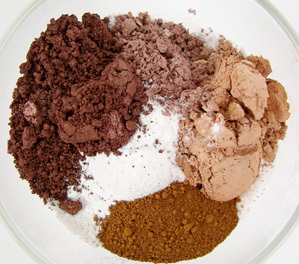 Make your own mineral makeup powder bronzer with this easy recipe. 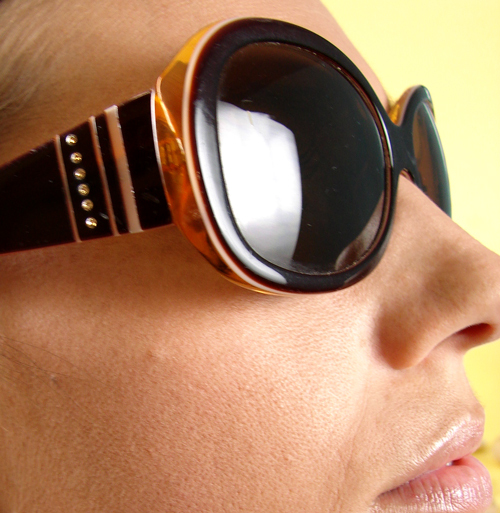 You’ll have that sun-tanned, lustrous look in no time! Blend: Add all of the ingredients to a small mixing bowl and blend well. Once the ingredients are fully mixed (no clumps), scoop the bronzer into a 4 oz jar. Tip: Mix in a spice grinder or clean coffee grinder for an ultra fine blend. 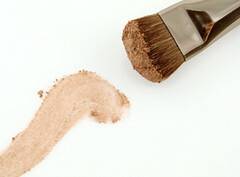 Apply: Dip the brush into the powder and tap off any loose powder. Then lightly and evenly, brush the foundation on your face in a circular motion. Make sure you get all areas; forehead, cheeks, under eyes, and jaw bone. guinea pig and letting me test my bronzer on her. She was a good sport and it looked great on her! Mother’s day is less than 2 weeks away. Ack! Are you ready? Here’s an easy mineral makeup gift ensemble for Mom. I created these new recipes based on my Mom’s taste. She’s a pink and plum type of gal (do you remember the pink paint posts here and here? Well, her house is pretty in pink). So, naturally, I went with a light plum eye shadow, light pink blush and glossy pink lip shine. I know she’ll love it. What Mom doesn’t adore handmade gifts on Mother’s Day? Not sure how to mix Mineral Make Up? I have you covered! Eye Shadow mixing tutorial here, video on Eye Shadow mixing here, Foiling tutorial here, another eye shadow blending tutorial here, and lip stick tutorial here, here and here. If you want to do this yourself at home, you can! It’s easy (I swear). Buy the book here. Check out the Starter Foundation Kit here or the DIY Eye Shadow Kits here and have yourself a DIY Mineral MakeUp party. Recently a bill has been proposed in Colorado, the ‘Colorado Safe Personal Care Products Act’. Here is a link to the full Act. There are hearings coming up in March in Colorado. You can attend to learn more or voice your opinions. To sum up the bill it would prohibit the sale of ‘…any personal care product that contains a chemical identified as causing cancer or reproductive toxicity.’ This in itself sounds good! After all, who could possibly argue with crafting safe products? But this bill is not setting reasonable limits – it would be an outright ban on anything that is even classified as a ‘potential’ carcinogen. It’s a broadly worded bill that would have many unintended consequences. 1. The bill is overly broad and would ban many natural ingredients. For example, many people may not realize about this is that this Act would ban even naturally occurring substances that can be found in extracts and essential oils. For example, one of the components of Basil, Citronella, Rose Otto and Tarragon Essential Oils is Methyleugenol. This essential oil component is considered a carcinogen. Does that mean we wouldn’t be able to use these safe, natural additives in our formulations? The way the current legislation is written would open the manufacturer up to fines of $10,000. This law, while well-meaning, is too general and will harm small personal care manufacturers who have less choice of ingredients to use and may in fact, prefer to use all natural ingredients, like essential oils. The proposed bill is very definite with its complete ban instead of safe usage restrictions which would make more sense (and already exist). 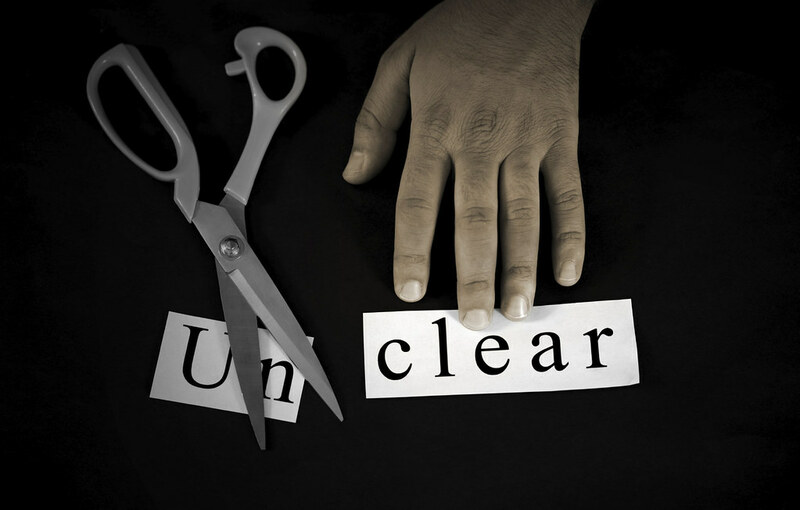 Testing of chemicals and ingredients to classify them as ‘potential’ carcinogens is done in very concentrated amounts of the product, generally in larger amounts than the ingredients are used in ‘real life’. 2. How to make your voice heard. For anyone who would like to voice their opinion, the House Judiciary Committee will be having a hearing for those both in support of and in opposition of this bill on March 1st. The meeting will be in the basement of the Capitol Building, in room 0107. The bill is sponsored in the house by Dianne Primavera phone # 303-866-4667 click here to email, Dennis Apuan phone # 303-866-3069 click here to email, Karen Middleton phone # 303-866-3911 click here to email, Joe Miklosi Cap phone # 303-866-2910 click here to email. A group in Colorado that is in support of this bill is The Women’s Lobby of Colorado. They hold open meetings so anyone who would like to speak in opposition to this bill or in support of a bill simply asking for safe usage rates, can contact them at [email protected] for information on their meetings. It is important that we speak up for safe regulations instead of a complete ban. Using natural and safe ingredients and taking care of our bodies is important. There is already a governing body that covers beauty ingredients and cosmetic products – the FDA. They have comprehensive guidelines on best manufacturing practices, labeling laws and there already are safety guidelines in place for essential oils, preservatives, fragrance oils and other additives. 3. The bill is backed by questionable science. 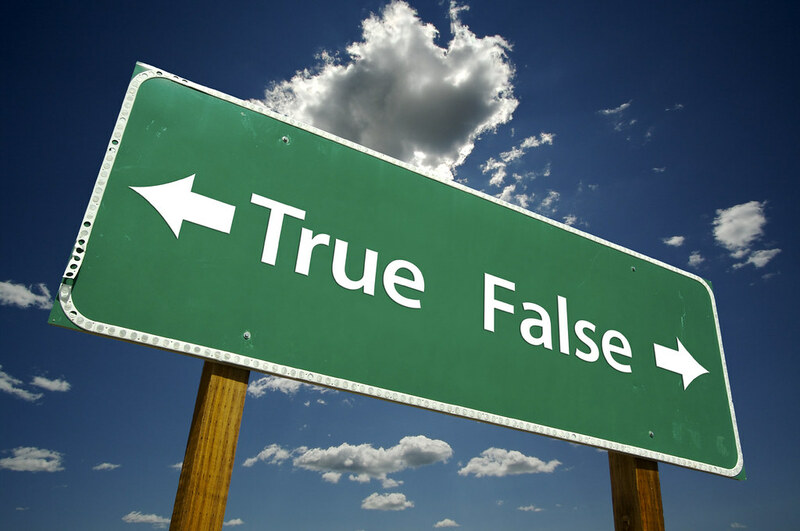 Personal care products are not introduced directly into your body in a dose (like a drug); they are not in any way introduced ‘in vitro’. They are leave on and rinse off. If lotions really absorbed in all that well, anti-wrinkle creams would work like the packaging says they do. If the bill passes as written, many natural options would also be effectively no longer available. We need to speak up for safe and knowledgeable regulation that takes into consideration natural occurrence and recognizes the difference between concentrated doses and personal care product use. Remember, salt and water can kill and no one is looking to ban any of those items. For a business perspective on why this bill doesn’t make sense, head over to Donna Maria’s blog here. One: Pick your favorite holiday red or maroon color to paint your nails. 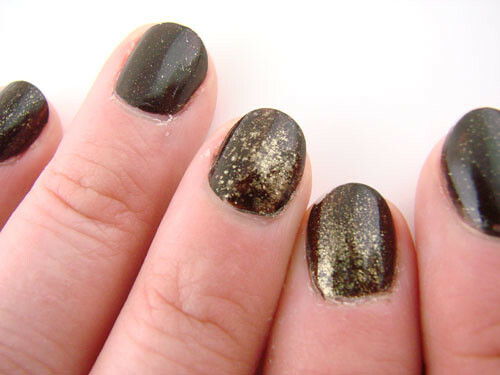 Two: Add your clear top coat and sprinkle on the mica for a fabulous holiday accent. Tip: Use an eye shadow brush to tap on the mica. This will give you an evenly sparkled look! Let’s take a look back at our favorite SoapQueen Fall projects from years past, including some yummy (food) recipes that would be great for Thanksgiving appetizers! Fiery Energy BarWe’d hate for you to miss any of the great inspiration from years past. Click through to the links if any of them sound unfamiliar to you. As the days begin to cool, I am eagerly looking forward to the autumn colors and crisp air. In anticipation of the fall splendor I wanted to share this recipe for a warm shimmery pumpkin orange eyeshadow and instructions on how to use it. Enjoy! 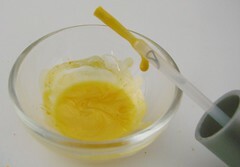 Directions: I used the mini .15cc pigment scoops sold here. But you can use any measurement as long as you keep the proportions the same. 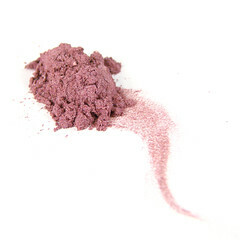 It’s easy to make this color: place all of your measured powders in a container (like a lip balm pot) and mix well. That’s it, you’re done! I did a show on Better TV last year and you can see how easy it is to mix. We did that, plus talked about 2 other projects – all in 3 minutes! You can watch that video here. For this look, I used the Pumpkin Shimmer eyeshadow blend along with the Light Brown and Dark Brown recipes from our Mineral Makeup Guide Book. 1. 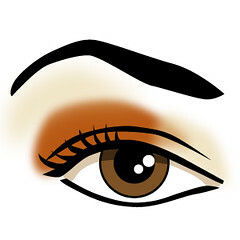 Apply Pumpkin Shimmer on center of lid to outer edge up to crease. 2. Apply Light Brown eyeshadow to inner lid and brow arch blending well. 3. Apply dark brown eyeshadow to outer edge of the eyelid and along crease. Also apply along the lower lash line but only 3/4 of the way across. Again, blend well. 4. Reapply a little more Pumpkin Shimmer to the center of the lid if you have blended it in and want a little more coppery goodness to show! 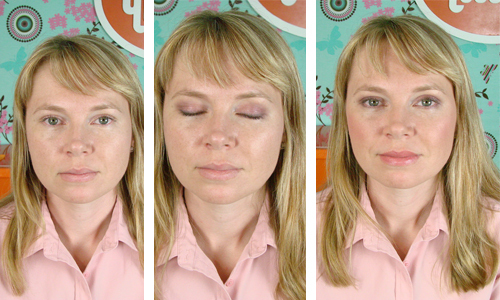 Making eye shadows is super easy. You can buy all the ingredients seperately or you can buy the comprehensive starter kit we’ve put together here. No matter how you look at it, making your own make up is affordable, easy and fast. You can create what you love, make it your own and have fun doing it! 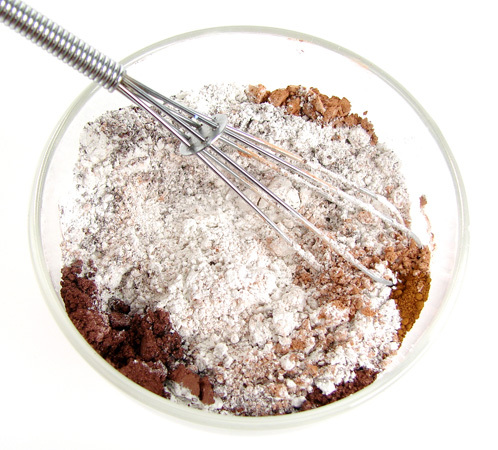 If you’ve created any eye shadow recipes you’d like to share with the Soap Queen Community, post them here. I’d love to try them out myself this fall season. Thank you for all the feedback on the previous post! Commenters SingingWolf and Maggie both mentioned that if you give the Lip Balm Tubes a little extra umph that you don’t need to trim. They totally beat me to the punch. The lip balm on the left was pushed a little farther into the pour tray than the rest and requires no trimming (unless you’re super persnickety like me). It’s easier to push the lip balm tubes in more deeply with the entire tray flipped over onto its back, like a helpless turtle. I also wanted to remind everyone that cutting off the tops is a total personal preference. This is how I have always done it; plus I love the smooth finish. But feel free to pop on the cap (over the lip balm lip) and call it a day. 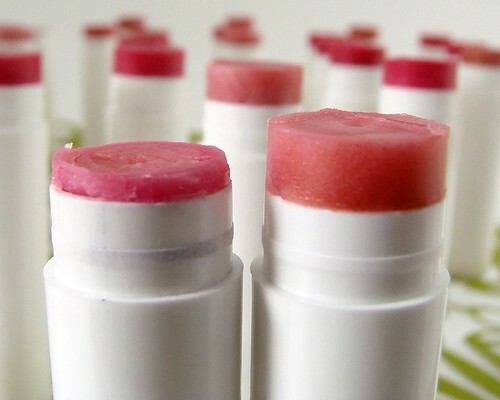 After all, your time is money and that trim time adds to the unit cost per lip balm. But think (and rejoice) of all the time you saved filling 50 lip balm tubes at once (rather than that gosh darn individual dropper method). 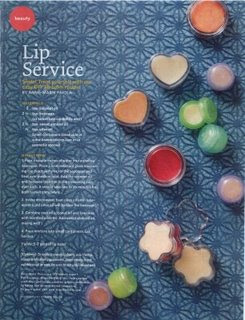 Now, go forth and make the most luscious, cost-effective lip butters on the planet. You’ll make a lot of lips soft and happy. “The Massive Pour”: Fill up all 50 tubes with one giant pour. Then scrape off the excess lip balm and save it for another batch. If you choose this option you will need to do a “clean up” (see below). 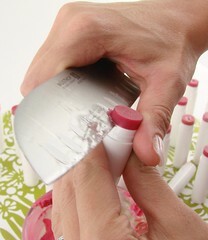 “The Conservative Pour”: Fill each individual tube just below the rim so there is no extra lip balm sticking out. This Method does not require a clean up. 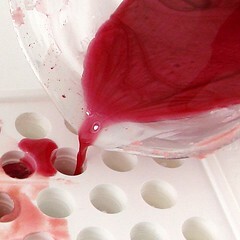 Let the lip balm harden and release from the pouring tray. Just pop on the caps and they’re ready for your 50 closest friends! 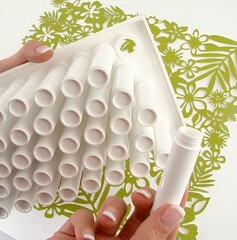 “The Clean Up”: Once the lip balm has hardened release the tubes from the pouring tray. Take your knife and slice off the tops (which you can melt and use again). Once the tops are smooth (as a baby’s you-know-what) pop on the caps. You’re done! PS – You can cut with the knife going away from you depending on your comfort level with knives. Having officially taken a real knife skills class (yes, there is such a thing in the wonderful town of Bellingham), I was just a wee bit confident but you don’t need to be. Cutting the other way works just as well. Yesterday was a jam packed day that had all the best elements New York City has to offer. I spent the day talking to magazine editors about how they could utilize Bramble Berry products and projects in upcoming editions of their magazine. It’s hard to know how those went because they’re a little like job interviews; you bring samples, you put your best foot forward and then you hope they call. What I know went well was Martha Stewart Living Radio. I was on with host Mario Bosquez from Living Today. He’s been gracious enough to have me on the show three times now and it felt like coming to visit a good friend. We talked about Flexy Fast (I even made some on the air) and upcoming episodes of SoapQueen.TV He was pretty excited about what I have in store for you this week. The best part of the show for me was that 7 soapmakers called in with questions. It was so gratifying to have people call in to talk about soap. We had questions on essential oil usage, safe disposal of lye, non-bleeding colors and Gillian (the winner of the ‘Best in Show’ at the Soap Guild Conference this year) even called in with a question on combining melt and pour and cold process. The 30 minute segment went by in the blink of an eye. I am so thankful for the opportunity to talk to more soapers and hopefully introduce a wider audience to the joys of soap. I ended the evening with an amazing show – Billy Elliot, the Musical. Elton John wrote the music for this powerful and moving story about a young boy following his dreams. It received 10 Tony Awards. It was a totally packed house and the audience gave the actors a standing ovation several times; the show was that good. 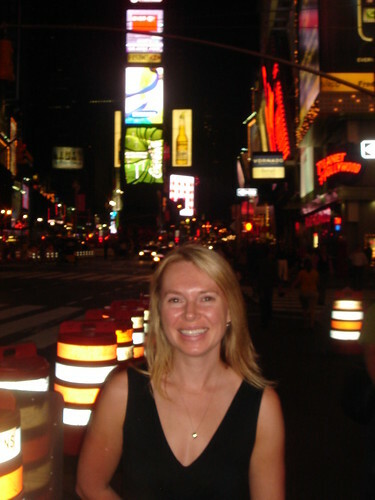 Finally, I neded the evening in traidtional tourist way – in Times Square getting a dorky photo of myself taken. It’s very warm and humid. Today, I’m headed to New Jersey to meet with some teen magazine editors to talk about our DIY Eye Shadow, Foundation and Lipstick kits. The combination of those plus the DIY Perfume kits would make a great slumber party. 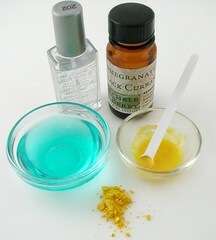 Make any color under the sun just by using mica and your clear nail polish. You can even add a drop or two of fragrance oil to make it extra special and scented. 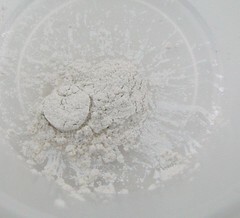 Step 1: Pour a small amount of nail polish into a small mixing bowl and add pinch of mica (whatever color inspires you). We did 1 small .15cc scoop of mica to .25 oz of nail polish for the final photo below. Step 2 (optional): Add 2-3 drops of fragrance oil (your favorite summer scent – suggestions: Summer Fling, Black Raspberry Vanilla type, Beach Breezes or Apricot Freesia)Step 3: Because we’re adding to the already-thick nail polish, we added 2-3 drops of nail polish remover to thin it back out.Step 3: Paint nails with one of your extra nail polish brushes. **Brushes will be for a one time use only. **cleaning the brushed seemed to be our only challenge. Soaking the brushes in nail polish remover and washing them still didn’t seem to clean up our brushes. Let us know if you have any tips!Step 4: Once the nails are dry, immediately flaunt them! If you come up with any great mica blends, let me know. I definitely want to hear about any cool color blends that you design. “When I told my friends I was going to make lip balm (from your recipe in the Kiwi Magazine) they thought I was nuts….fast forward to having made the lip balm and passed it out to people to try – “WOW, this is the best stuff Ive ever used…” I received the same unsolicited comment from about five different sources…Soooooo – thanks for sharing the recipe…I created my own combos of fragrance and colors (with your micas) but the basic recipe is yours!!! 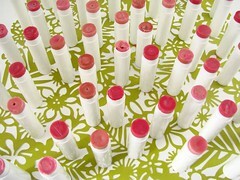 Now I have to order more lip balm tubes so I can make more!! !” -Starla Here’s a link to the recipe if you want to give it a try too!